Krak des Chevaliers is one of the best-preserved Crusader castles. 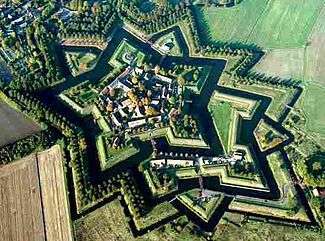 Fort Bourtange star fort, restored to 1750 situation, Groningen (province), Netherlands. The art of setting out a military camp or constructing a fortification traditionally has been called "castramentation" since the time of the Roman legions. Fortification is usually divided into two branches: permanent fortification and field fortification. There is also an intermediate branch known as semi-permanent fortification. Castles are fortifications which are regarded as being distinct from the generic fort or fortress in that they are a residence of a monarch or noble and command a specific defensive territory. Medieval-style fortifications were largely made obsolete by the arrival of cannons in the 14th century. Fortifications in the age of black powder evolved into much lower structures with greater use of ditches and earth ramparts that would absorb and disperse the energy of cannon fire. Walls exposed to direct cannon fire were very vulnerable, so were sunk into ditches fronted by earth slopes. Srebrenik Fortress in Bosnia and Herzegovina, one of the Bosnia's best-preserved medieval castles dating from at least 1333. 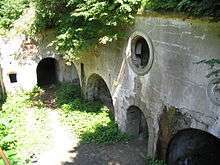 Many military installations are known as "forts", although they are not always fortified. Larger forts may be called "fortresses"; smaller ones were once known as "fortalices". The word "fortification" can also refer to the practice of improving an area's defence with defensive works. City walls are fortifications but are not necessarily called fortresses. 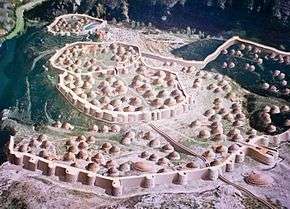 The art of setting out a military camp or constructing a fortification traditionally has been called "castramentation" since the time of the Roman legions. The art/science of laying siege to a fortification and of destroying it is commonly called "siegecraft" or "siege warfare" and is formally known as poliorcetics. In some texts this latter term also applies to the art of building a fortification. Fortification is usually divided into two branches: permanent fortification and field fortification. Permanent fortifications are erected at leisure, with all the resources that a state can supply of constructive and mechanical skill, and are built of enduring materials. Field fortifications—for example breastworks— and often known as fieldworks or earthworks, are extemporized by troops in the field, perhaps assisted by such local labour and tools as may be procurable and with materials that do not require much preparation, such as earth, brushwood and light timber, or sandbags (see sangar). An example of the "Field Fortification" was the construction of "Fort Necessity" by George Washington in 1754. A model of the prehistoric town of Los Millares 3000 BC Spain, with its walls. 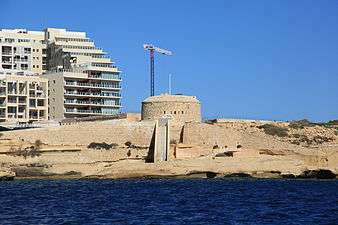 In Bronze Age Malta, some settlements also began to be fortified. The most notable surviving example is Borġ in-Nadur, where a bastion built in around 1500 BC was found. In ancient Greece, large stone walls had been built in Mycenaean Greece, such as the ancient site of Mycenae (famous for the huge stone blocks of its 'cyclopean' walls). In classical era Greece, the city of Athens built two parallel stone walls, called the Long Walls, that reached their fortified seaport at Piraeus a few miles away. The Oppidum of Manching (German: Oppidum von Manching) was a large Celtic proto-urban or city-like settlement at modern-day Manching (near Ingolstadt), Bavaria (Germany). 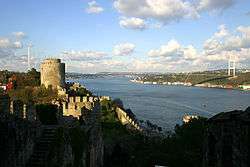 The settlement was founded in the 3rd century BC and existed until c. 50-30 BC. It reached its largest extent during the late La Tène period (late 2nd century BC), when it had a size of 380 hectares. At that time, 5,000 to 10,000 people lived within its 7.2 km long walls. The Aurelian Walls (Italian: Mura aureliane) are a line of city walls built between 271 AD and 275 AD in Rome, Italy, during the reign of the Roman Emperors Aurelian and Probus. The walls enclosed all the seven hills of Rome plus the Campus Martius and, on the right bank of the Tiber, the Trastevere district. The river banks within the city limits appear to have been left unfortified, although they were fortified along the Campus Martius. The full circuit ran for 19 kilometres (12 mi) surrounding an area of 13.7 square kilometres (5.3 sq mi). The walls were constructed in brick-faced concrete, 3.5 metres (11 ft) thick and 8 metres (26 ft) high, with a square tower every 100 Roman feet (29.6 metres (97 ft)). In the 5th century, remodelling doubled the height of the walls to 16 metres (52 ft). 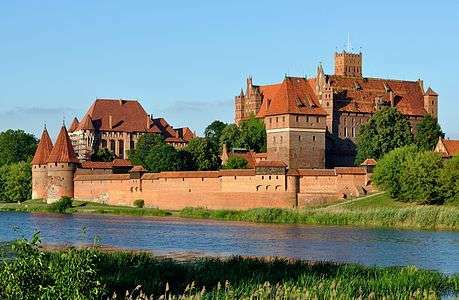 By 500 AD, the circuit possessed 383 towers, 7,020 crenellations, 18 main gates, 5 postern gates, 116 latrines, and 2,066 large external windows. 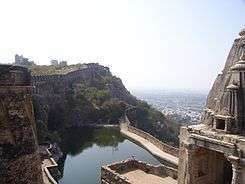 Chittorgarh Fort and Mehrangarh Fort built under Hindu Rajput states are the largest fort examples on the Indian subcontinent. India has more forts than any other country in the world, which were built in all periods between the late stone age and the British Raj. "Fort" is the word used in India for all old fortifications. India currently has over 180 forts, with the state of Maharashtra alone having over 70 forts, which are also known as durg, many of them built by Shivaji, founder of the Maratha state. 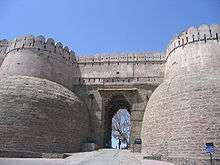 Among all forts in India the most famous forts are the Red Fort at Delhi, the Red Fort at Agra, the Chittorgarh Fort and Mehrangarh Fort in Rajasthan, the Ranthambhor Fort in Rajasthan and Gwalior Fort in Madhya Pradesh. Large tempered earth (i.e. rammed earth) walls were built in ancient China since the Shang Dynasty (c. 1600-1050 BC); the capital at ancient Ao had enormous walls built in this fashion (see siege for more info). Although stone walls were built in China during the Warring States (481-221 BC), mass conversion to stone architecture did not begin in earnest until the Tang Dynasty (618-907 AD). 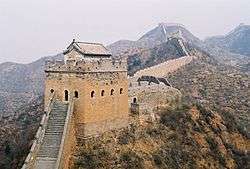 The Great Wall had been built since the Qin Dynasty (221-207 BC), although its present form was mostly an engineering feat and remodelling of the Ming Dynasty (1368-1644 AD). The large walls of Pingyao serve as one example. Likewise, the famous walls of the Forbidden City in Beijing were established in the early 15th century by the Yongle Emperor. Idjang in Savidug Batanes, Philippines. The defensive wall of Hispanic Colonial Intramuros in Manila, Philippines. 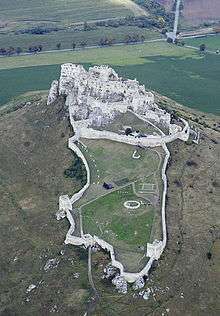 Spiš Castle in Slovakia - one of the largest castles in Central Europe. 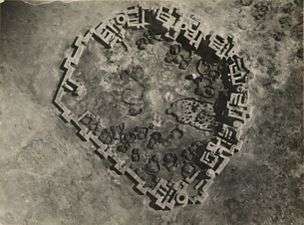 An aerial photography documents its enlargement in the course of 11th - 17th centuries. Jajce is a walled city in Bosnia and Herzegovina, protected by two rivers and long walls. The Early Middle Ages saw the creation of some towns built around castles. These cities were only rarely protected by simple stone walls and more usually by a combination of both walls and ditches. 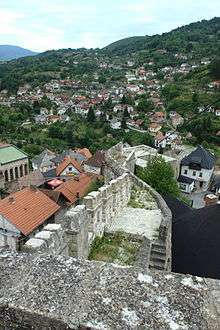 From the 12th century hundreds of settlements of all sizes were founded all across Europe, which very often obtained the right of fortification soon afterwards. 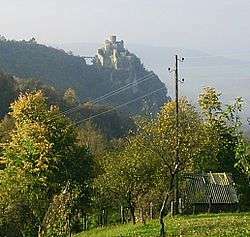 The well preserved Bulgarian medieval fort Baba Vida. During the Renaissance era, the Venetians raised great walls around cities threatened by the Ottoman Empire. The finest examples are, among others, in Nicosia (Cyprus) and Chania (Crete), which proved to be futile but still stand to this day. Much of the fort moved underground. Deep passages and tunnels now connected the blockhouses and firing points in the ditch to the fort proper, with magazines and machine rooms deep under the surface. The guns, however, were often mounted in open emplacements and protected only by a parapet; both in order to keep a lower profile and also because experience with guns in closed casemates had seen them put out of action by rubble as their own casemates were collapsed around them. Aerial photograph, Fort de Douaumont, Verdun (1916). 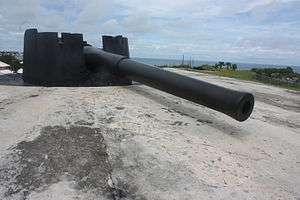 St. David's Battery, housing coastal artillery in Bermuda, was placed below ground level, except its guns, obscuring it from view and protecting it from return fire. Defending against landward attack was not a consideration, consequently the rear of the battery is exposed, and there is no defensive wall or ditch. The ever escalating power, speed, and reach of artillery and air power meant that almost any target that could be located could be destroyed, if sufficient force were massed against it. As such, the more resources a defender devoted to reinforcing a fortification, the more combat power that fortification justified being devoted to destroying it, if the fortification's destruction was demanded by an attacker's strategy. From World War II, bunker busters were used against fortifications. By 1950, nuclear weapons were capable of destroying entire cities, and produced dangerous radiation. This led to the creation of civilian nuclear air raid shelters. Just as in colonial periods, comparatively obsolete fortifications are still used for low-intensity conflicts. Such fortifications range in size from small patrol bases or forward operating bases up to huge airbases such as Camp Bastion/Leatherneck in Afghanistan. 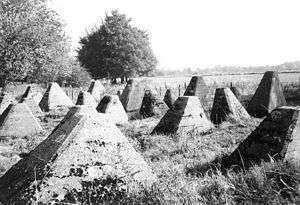 Much like in the 18th and 19th century, because the enemy is not a powerful military force with the heavy weaponry required to destroy fortifications, walls of gabion, sandbag or even simple mud can provide protection against small arms and anti-tank weapons - although such fortifications are still vulnerable to mortar and artillery fire. Engineers fill Hesco bastions at a forward operating base in Afghanistan. 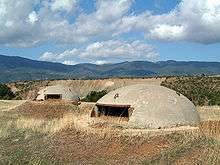 Forts in modern usage often refer to space set aside by governments for a permanent military facility; these often do not have any actual fortifications, and can have specializations (military barracks, administration, medical facilities, or intelligence). In the United States usage, forts specifically refer to US Army bases; US Marine Corps bases are referred to as camps. This historical reconstruction, of an American frontier fort, featured a log stockade, with a sturdy blockhouse built, as a temporary, defensive structure, on the western frontier. Fort Snelling on, the confluence of, the Mississippi and Minnesota Rivers, in 1844, in a painting by John Caspar Wild (1804-1846). 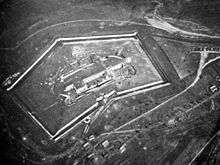 Fortifications designed to keep the inhabitants of a facility in rather than out can also be found, in prisons, concentration camps, and other such facilities, with supermaxes having some of the strongest of those. 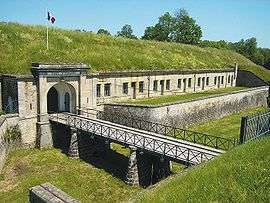 Those are covered in other articles, as most prisons and concentration camps are not primarily military forts (although forts, camps, and garrison towns have been used as prisons and/or concentration camps; see Theresienstadt, Guantanamo Bay detention camp, and the Tower of London for examples). 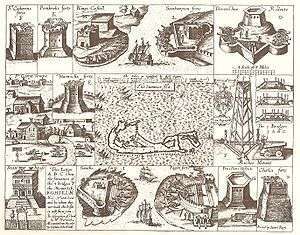 Captain John Smith's 1624 map of Bermuda, showing important sites, including the Castle Islands Fortifications. The Kumbhalgarh Fort in Rajasthan, India. 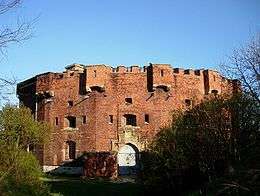 For more than three centuries, the fort remained impregnable. The effect of thirty years evolution in the design of coastal fortifications, between the 1790s and 1822, can be discerned between Ferry Island Fort (in the foreground), with multiple guns arrayed to cover the water westward, and the Martello tower in the background, which used a single gun with 360° traverse to cover all of the surrounding area. Ferry Reach, Bermuda, 2011. Klis Fortress in Croatia, built into the south face of a rocky mass. Lost and re-conquered several times over more than two thousand years. St. Angelo Fort, Kannur, Kerala, India built by Portuguese in 1505. Forte dos Reis Magos in Natal, Brazil, built in 1599. 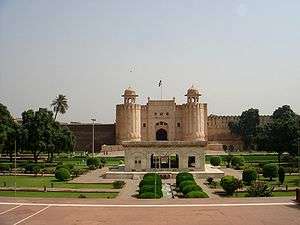 View of Alamghiri Gate of Lahore Fort. Petrovaradin Fortress "Gibraltar on the Danube" - Austrian fortress from the 18th century and one of the best preserved fortifications in Serbia. 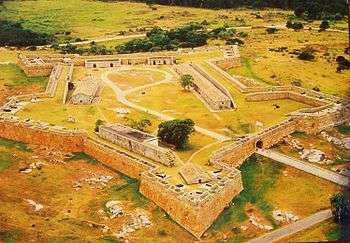 Fortaleza de Santa Teresa - Fortress in Eastern Uruguay built in 1762 by Portugal, later occupied by Spain and finally by Uruguay garrisons alternatively. Fortifications of Edinburgh Castle used the natural volcanic landscape to best advantage. Image painted by Alexander Nasmyth (~1780). Fort Tigné in Sliema, Malta. 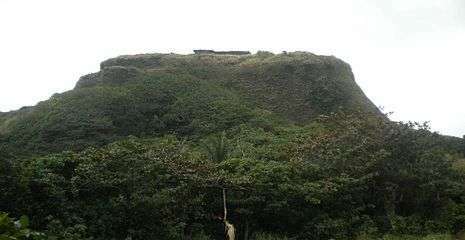 It is one of the oldest polygonal forts in the world. 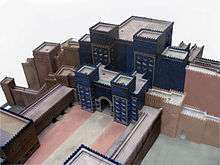 Aerial view of Mohammed Abdullah Hassan's main fort in Taleh, the capital of his Dervish State. Rödberget fort, a part of the modern Boden Fortress in Sweden, seen from the north. 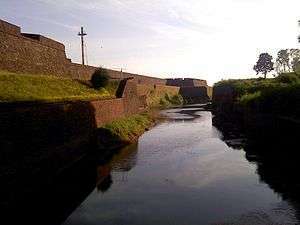 The moat and the armored turrets are clearly visible. 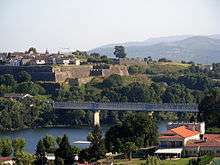 ↑ "Bulgaria claims to find Europe's oldest town - Technology & science - Science | NBC News". MSNBC. 2012-11-01. Retrieved 2013-05-04. ↑ "BBC News - Europe's oldest prehistoric town unearthed in Bulgaria". Bbc.co.uk. 2012-10-31. Retrieved 2013-05-04. ↑ "Organization of neolithic settlements:house construction". Greek-thesaurus.gr. Retrieved 2013-05-04. ↑ "Hellenic Ministry of Culture and Tourism | Sesklo". Odysseus.culture.gr. Retrieved 2013-05-04. ↑ The Ness of Brodgar Excavations. "The Ness of Brodgar Excavations – The 'Great Wall of Brodgar'". Orkneyjar.com. Retrieved 2013-05-04. ↑ Alex Whitaker. "The Ness of Brodgar". Ancient-wisdom.co.uk. Retrieved 2013-05-04. ↑ Focke, Arne (2006). "Die Heuneburg an der oberen Donau: Die Siedlungsstrukturen". isentosamballerer.de (in German). ↑ "Erforschung und Geschichte der Heuneburg". Celtic Museum Heuneburg (in German). Archived from the original on 24 June 2007. ↑ Durga is the Sanskrit word for "inaccessible place", hence "fort" Nossov 2012, p. 8 Hiltebeitel, Alf (1991). The Cult of Draupadī: Mythologies: From Gingee to Kurukserta. 1. Delhi, India: Motilal Banarsidass. p. 62. ISBN 978-81-208-1000-6. ↑ Nossov, Konstantin (2012). Indian Castles 1206-1526: The Rise and Fall of the Delhi Sultanate (second ed.). Oxford, England: Osprey Publishing. p. 8. ISBN 978-1-78096-985-5. ↑ "15 Most Intense Archaeological Discoveries in Philippine History". FilipiKnow. Retrieved 17 March 2015. ↑ Ancient and Pre-Spanis Era of the Philippines. Accessed September 04, 2008. ↑ "Sultan of the River: The Rise and Fall of Datu Uto of Buayan". nhcpmanila's Blog. Retrieved 17 March 2015. ↑ "The Battle of Bayan - May 2 p2". Retrieved 17 March 2015. ↑ Administrator. "Where to Go - The KUTAWATO CAVES". Retrieved 17 March 2015. Watt, William M. (1974). Muhammad: Prophet and Statesman. Oxford University Press. p. 96. ISBN 0-19-881078-4. ↑ William Muir, The life of Mahomet and history of Islam to the era of the Hegira, Volume 4, p. 142. ↑ Medieval Town of Rhodes - Restoration Works (1985-2000) - Part One. Rhodes: Ministry of Culture – Works supervision committee for the monuments of the medieval town of Rhodes. 2001. ↑ Mifsud, Simon (14 September 2012). "Fort Campbell". MilitaryArchitecture.com. Retrieved 15 March 2015. ↑ Albania's Chemical Cache Raises Fears About Others—Washington Post, Monday 10 January 2005, p. A01.